1. Endless earnings: Quarterly earnings are going to keep piling up on Tuesday. Companies including 3M (MMM), Eli Lilly (LLY), Harley-Davidson (HOG), JetBlue Airways (JBLU), Kimberly-Clark (KMB), Lockheed Martin (LMT), Sherwin-Williams (SHW) and Verizon (VZ) will report before the open. Investors will be watching to see what Harley-Davidson says about tariffs. The motorcycle giant said last month that it would shift some production out of the United States to avoid tariffs imposed in retaliation for Trump administration policies. AT&T (T), Chubb (CB) and Texas Instruments (TXN) will release earnings after the close. 2. European earnings: PSA Group (PUGOY), which owns the Peugeot and Opel brands, reported a 40% surge in sales in the first six months of the year. Analysts at Jefferies said there were "impressive numbers all around," and the stock surged 9%. Shares in UBS (UBS) shot up 3% after the Swiss bank reported a net profit of 1.3 billion Swiss franc ($1.3 billion) for the second quarter. 3. Google powers ahead: Shares in Google's (GOOGL) parent company Alphabet were up 4% premarket after the tech giant reported quarter results on Monday. Profits were dented in the second quarter by last week's record $5 billion European antitrust fine, but a surge in sales offset that hit. The company's profit fell to $3.2 billion in the quarter ending in June, down from about $3.5 billion in the same period a year ago. Without the penalty, Alphabet's profit would have been $8.3 billion. When asked about the potential business impacts from the EU ruling on a conference call with analysts Monday, Google CEO Sundar Pichai said it's "too early" to tell. "We are analyzing the decision," he said. 4. Stock market movers -- Whirlpool, Changchun Changsheng Biotechnology: Whirlpool (WHR) shares are slated to drop by about 10% at the open as investors react to worse-than-expected quarterly results. Shares in Changchun Changsheng Biotechnology dropped 10% in Shenzhen after police in China launched a criminal investigation into faulty vaccines from the company. 5. Global market overview: US stock futures were steady. Nearly all European markets advanced in early trading. 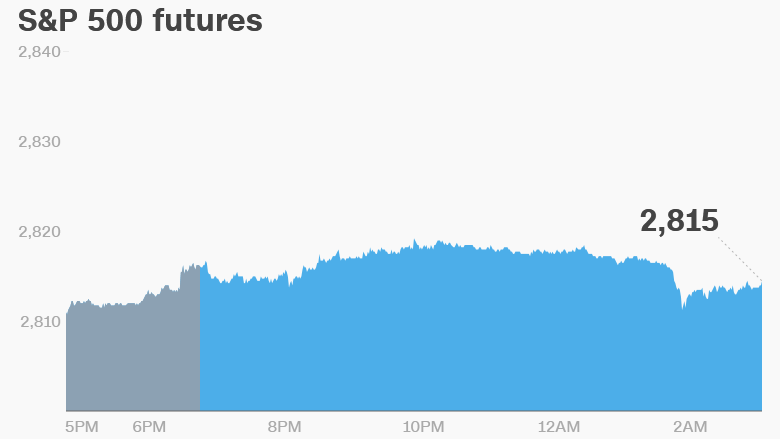 Asian markets ended the day with gains after the Chinese government reportedly unveiled an economic stimulus package. The move could help counter the threat of heightened trade tensions with the United States. Key Chinese indexes gained roughly 1.5%.